You perhaps don’t know it but swimming is by far my favorite sport. This is to the point that I seriously consider having one day my own pool to daily swim a kilometer of breaststroke. One of the problems faced by swimming pools – besides using a lot of water, an increasingly scarce resource – is the extensive use of potentially harmful chemicals like chlorine. But the Daily Green provides us with great data and pictures on natural swimming pools, an alternative to their traditional counterparts. Swimming can be great exercise and a lot of fun, not to mention an exciting sport at the Olympics. But the chlorine used in most pools can have some negative side effects, not the least of which is reliance on toxic (and finicky) chemicals. Chlorine’s damaging effects on hair are well known, but few people realize that a number of studies have linked inhalation of the chemical by swimmers to increased asthma rates. A Norwegian study also documented an increased risk of wheezing among children who swim in pools before 6 months of age. In an unpleasant reaction, pee and sweat in water can react with chlorine to form toxic breakdown products known as chloramines. For health, environmental and aesthetic reasons, a lot of people have expressed interest in alternatives to chlorine pools, and luckily there are more and more options to get wet without smelling like cleaning products. A company called TechnoPure offers alternative pool systems that treat water by pumping it through a chamber containing coated titanium plates and copper and zinc ions. The units cost a relatively affordable $5,500. DEL Ozone makes ozone injectors that can reduce the need for chlorine up to 90% — there’s been one installed at the White House for years! Some systems rely on a combination of ozone and copper and silver ions, while others are saline, though saltwater pools result in the formation of chlorine in the water. One elegant, eco-friendly solution that has had enthusiastic supporters in Europe for decades is the so-called natural swimming pool, which is slowly beginning to gain buzz in the U.S. Natural swimming pools, often called swimming ponds across the Atlantic, can be beautiful oases of greenery and sustainability, as well as safe, fun places to take a dip. Managed properly, natural swimming pools have crystal clear water and require no chemicals to maintain, as they are self-cleaning mini-ecosystems. “You can drink the water if you want to, and you don’t necessarily have to take a shower,” says Morgan Brown of Idaho-based Whole Water Systems, LLC. 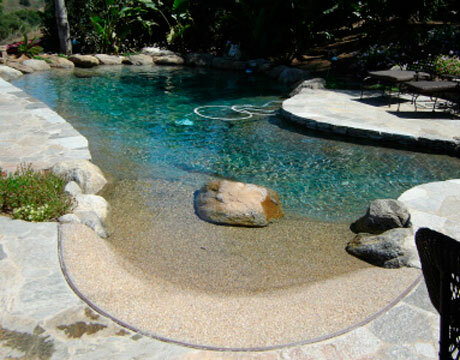 The natural pools designer says the systems also have lower maintenance costs than conventional pools, and their installation costs are not much more than standard designs. Read on for more info on natural pools — sometimes called green pools or organic pools — and photos of some of the most gorgeous designs around. I think that most pools in the world are measured in metres, but in the United States pools are almost always measured in feet and yards. In the United Kingdom most pools are in metres, but older pools measured in yards still exist. In the US pools tend to either be 25 yards (SCY-short course yards), 25 metres (SCM-short course metres) or 50 metres (long course). US high schools and the NCAA conduct short course (25 yards) competition. There also exist many swimming pools 33 m long, so that 3 lengths = 100 m. This pool dimension is commonly used to accommodate water polo. Following the trend for more environmentally friendly products a Natural Swimming Pool is a much more attractive option, and the technology today can guarantee clean and clear water – clean enough to drink!